Emmanuelle Pries is a sensitive and lovely French woman currently living in Germany with her husband and their fourteen year-old daughter. The glimpse of spirit she shares began two years ago with a nightmare scenario accident and ends with hearts broken wide open and a new life trajectory. 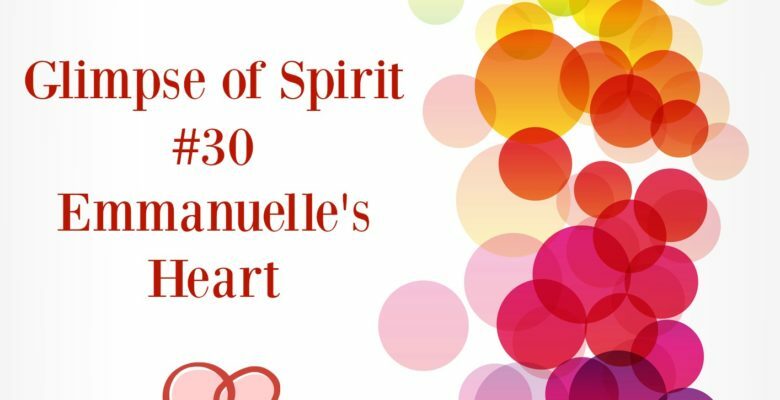 I am so grateful for our connection and thankful for Emmanuelle’s wisdom and honest sharing. Emmanuelle explains, “My husband was working at a job 500 kilometers away during the week. He would commute home to be with us on the weekends. One Friday, the police rang our doorbell at midnight to tell me that my husband had been in a terrible accident. All they knew was that he had been rescued by helicopter and taken to an area hospital over 5 hours away. I would not get any further details until I drove there with my daughter in the morning. Once they left, I lay back down in my bed and was completely overwhelmed by fear. It was so big. There was so much I didn’t know, so much outside of my control. I didn’t know if he would die during the night, if he would be paralyzed or what would become of us. What happened next would change my life forever. I started to shake. I could do nothing else but completely surrender to this fear. I had no choice. In that moment of surrender, something truly amazing happened. I met my spirit self. I remember so clearly the amazing JOY I felt despite the terror that was also happening. I felt my essence. I met the real me. You and I- we are all light. I know now that each of us is an extension of God. I know we are never alone although that night in the physical plane, I was very much alone. It did not feel like an “out of body experience” but rather somehow I went inside of my own heart and found the Universe there. In that moment, everything exploded into a million pieces within me. I was shown my whole life. I was shown all of the places where my current life was not in alignment and there were many. My career was off track. My marriage was off track. I had been making life choices based on fear instead of love. I was shown an image of myself stepping onto a roller coaster and was asked to put my seatbelt on. Everything was about to change and somehow, I knew even in the midst of this terror, it was going to be alright. In fact, it was going to be awesome. Another miracle from that evening that I will never be able to explain was being shown the accident in my mind’s eye. I heard my husband calling my name. My husband’s car had been travelling on the Autobahn at 180km/hour. I knew how he had lost control of his car and how it flipped head over tail four times. I felt the impact moving thru my body as if I was my husband. I don’t know how I was able to experience this. It felt like a miracle that didn’t even register until we got an accident report from the police a few weeks after that night. What happened in the days and weeks after the accident Emmanuelle? This clarity and enlightenment stayed with me in the days and weeks following that night. I would be crying at the hospital and then would sit for a moment and instantly go within and know that everything was going to be ok. It was surreal. As this happened again and again, all doubt evaporated. My husband had broken many bones and sustained a terrible concussion that kept him in a confused state for weeks. I did not know how we would pay our bills or if we would lose our house. And still, I just had this unshakeable faith and just knew the Universe was backing me up. When panic rose within me, I took things minute by minute until I could take things day by day. And do you know what? Miracles happened to help us out of financial ruin. Money showed up when it needed to out of nowhere. Insurance policies offered us the exact amount of money we needed to pay our bills and keep our home. From this surrender, I witnessed the laws of the universe in action. In this place of surrender, there is only love. Over time, my husband recovered and miracles happened within our marriage as well. We faced each other with a new authenticity. Our marriage became so much richer and more real. We even purchased new wedding rings with our original wedding date as well as the date of the accident engraved upon them. From that day forward, we were changed in a most beautiful way. We have since moved to a new city where the three of us live together. My husband got a new job. Our financial situation improved. Some friendships disappeared from the day he had the accident. New friends showed up. There was a huge cleanup in all aspects of our lives. How has this glimpse of spirit shifted your world? I live more in the moment now. I know now how life can be taken from us at any moment. It is so precious. Don’t worry about the past or the future. Be here- now. I also learned about acceptance. After the accident, my husband had limitations for a long time. I had to learn to really love him and honor his soul for where he was on any given day. I learned patience with others. I was less frustrated. I can now more easily love others for exactly who and where they are. Before the accident, I was always referred to as “the strong one.” I didn’t really share my emotions. The accident cracked me open and forced me to show love and be more open. I don’t really know why I didn’t do that before. The need to be right, in some difficult relationships, has dissolved as well. I was able to release resentment. It was as if the Universe came in and cleaned me out. It gave me a new, upgraded operating system. I feel so much better inside. I can cope and embrace things in a much lighter way. Once you trust and surrender, it is as if you are driving with a new GPS system. It is as if you now have a bird’s eye view rather than a sea level. What advice can you offer to others Emmanuelle? The only way to live the life you came here to experience is really to surrender and trust. We don’t do this due to fear. Prior to the accident, I knew our situation was not sustainable. I was unhappy that my husband was away at work and missing so much of our daughter’s childhood. I was miserable. However, we continued this arrangement out of fear and based on material comforts. We didn’t move because we had just bought a house and our daughter was attending a great private school. The universe wants us to somehow wake up and realize that we are making our life decisions based on fear and not love. For some, it takes an illness or a divorce or a loss of some kind. For us it was a devastating accident. Once we re-aligned our purpose with love, we sold the house. Our daughter is now in public school and she is just fine. So many lives all over the world will have their own amazing “aha” experiences at their own time and ways. I so much can relate, in the times we are living in right now we need to get back to our true self. We are truly love from the divine source of love. Nothing can change that.